Sara and Amy Hamann were immediately drawn to the upright Yamaha piano their father purchased as a gift for their mother. Sara was four years old, and Amy was five when they started taking lessons. Sara says friendly rivalry was an early motivator to practice. Amy agrees, "When we started we had so much competition between the two of us. Sara was 17 months younger than I am and there was no way I was going to let her be better than I was so I practiced all the time and she didn't want me to be better than she was." "So I think that motivated us as well, in addition to falling so in love with the instrument," Sara adds. "But also the sibling rivalry probably worked to our benefit." 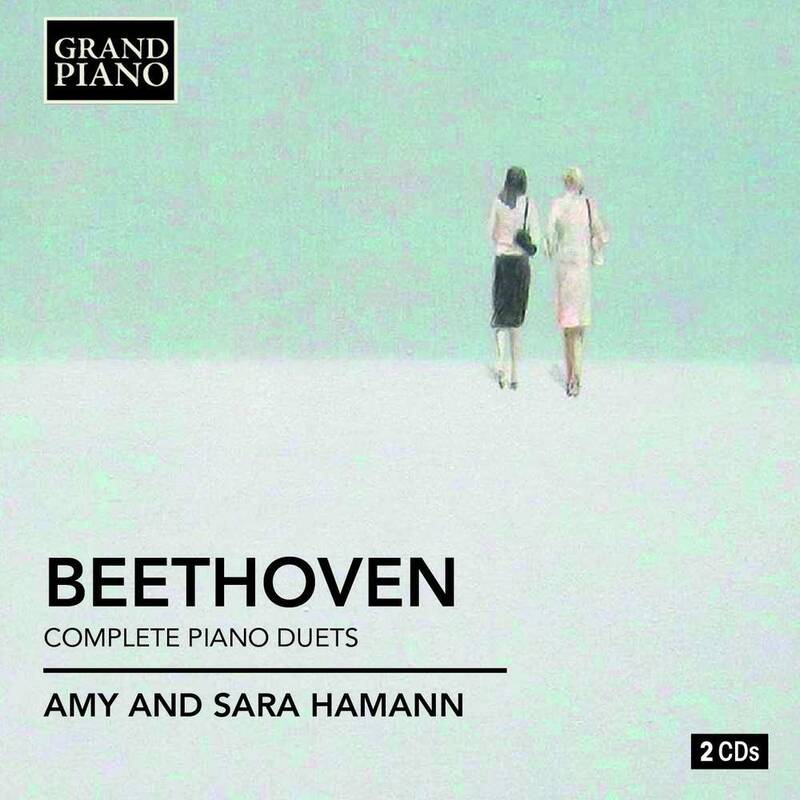 By the time they were eight and nine years old, Sara and Amy Hamann were already committed to performing four-hand piano music, and they've just released their first studio recording, Beethoven: The Complete Piano Duets. This is a two-CD set featuring these works on both a modern Yamaha piano; and on instruments of Beethoven's period. After winning a McKnight artist fellowship, they decided to put their award toward a special recording. Sara says the idea was to focus on a single composer. "And right around the time that we had won the fellowship, Beethoven's Grosse Fuge manuscript had been discovered in Philadelphia in a seminary and it sparked all of this interest in the piece. So we thought we should record that. Which then led us to doing the complete four-hand works, because we found out, wow, you can't get a complete disc of all of the works. And we were considering, do we want to do this on piano or do we want to do this on period instruments? And then we decided, why don't we do both — do a comparative recording?" The Schubert Club in St. Paul loaned Amy and Sara three fortepianos for this recording. There's a dramatic contrast in the sound of these keyboards compared to the modern piano. Amy says playing these instruments also posed unique challenges. "It feels much, much different than the modern pianos that we're used to. The first and foremost difference, I would say, is the range of the instruments is so much smaller. Our modern pianos today have a little over seven octaves and these fortepianos are only five octaves.The keys are quite a bit narrower as well. So we have to be very, very precise. They're very sensitive, so if you barely just touch a key, it makes a sound, whereas on a modern piano, it's a little more forgiving." The earliest fortepiano, from 1784, is featured on the Sonata in D major for piano, four hands. The sound of this instrument is most reminiscent of a harpsichord, and these early instruments also have another unique feature that makes them even more challenging to play. "The fortepianos have knee pedals as opposed to the pedals that are on the floor. So that's a big adjustment. It's also interesting — being a woman, your heel height really changes where your knee sits. There were all of these funny little things that we had to account for. We put our feet on books so that our knee would be able to easily hit the knee pedal. Otherwise, you end up using your entire leg and then you're distracted by the incredible pain that you're having in your hip from trying to use your whole leg." Elegant choreography is essential to creating a beautifully executed four-hand piano work. Amy explains this was especially critical in performing Beethoven's Grosse Fuge. Playing this work on two pianos would makes it much easier, and more physically comfortable for the performers, but Amy says that would change the overall effect of this dramatic work. "Then you're using two pedals versus one. He had it with one pedal in mind for all the sonorities versus two instruments, and each person having their own pedal. We try to really think of all those things when we're exploring music. Exploring... it's our job to convey the composer's intentions and his ideas and ideals about the piece — that's our job."